[Update Tue 4:15 PM: The PPPP will start as scheduled, meeting at 5:15 PM today and riding at 5:30 PM. Although there have been big and somewhat ominous looking clouds all afternoon, there has also been a fair amount of blue sky showing as well. The chance of rain is supposed to diminish into the evening. Nothing is ever certain, but it looks like it should be a nice evening for our Poky Pedaling Potluck Picnic. Our picnic destination will be a sheltered location. That way, we won’t need to deal with soggy ground, and if the rain does start up again, we will be able to stay dry during our picnic. 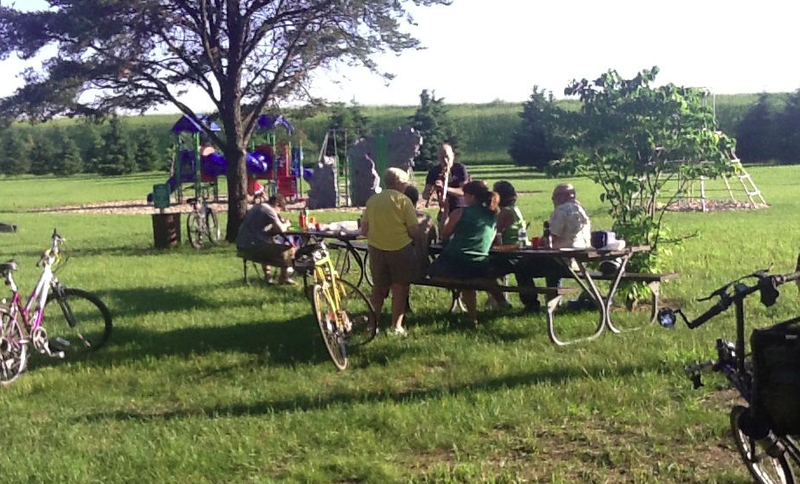 The Bike Fun keeps on coming as the monthly Poky Pedaling Potluck Picnic rolls around this Tuesday August 19. As usual, we’ll meet at 5:15 PM in Goerke Park near the entrance to the public swimming pool. From there, we’ll ride between 3 and 5 miles to a mystery park location that is different on each ride. As is the case for all Poky Pedals, the PPPP is free and all Poky Pedalers are welcome. Poky Pedalers are asked to bring a picnic goodie to share. This can range from a simple bag of chips to an elaborate casserole dish. All contributions are equally appreciated. We’ll carry these on our bikes to our mystery park location where we’ll enjoy our potluck picnic. If you don’t have a suitable way to carry your contribution on your bike, we’ll find room on someone else’s bike. Our collection of Poky Pedalers are pretty good at figuring this sort of thing out. If you are unable to arrange for your food or drink contribution before the ride, we have the option to stop at a food store along the way. If this is your preference, bring a few dollars to purchase something there. Once our feast is complete, we’ll ride back to Goerke Park. We should return well before dark. If you want to learn more about what to expect on the PPPP, this webpage has additional info as well as some ideas for picnic contributions. As of Sunday morning, the weather forecast for Tuesday afternoon does not look promising. Rain is predicted for much of the day on Tuesday. Although it looks to taper off by around the start of our Poky Pedal, wet weather could continue into the evening. We’ve never had to cancel a Poky Pedaling Potluck Picnic, but this is unfortunately a possibility for this Tuesday. Keep checking back to the PPSP website and this blog post to read updates on the status of the PPPP. I’ll also post updates to my Twitter feed, which appears in the right-hand column of the PPSP website. Based on the current forecast, a final decision about canceling probably won’t be made until close to our starting time. I’ll post a final update between 4 and 4:30 PM on Tuesday. If the storms have passed, our mystery park location will probably be somewhere with a covered shelter to escape soggy ground and to prevent any additional rain from dampening our picnic. Let’s hope the weather forecast is inaccurate and that clearing skies greet us for a splendid evening of Bike Fun on Tuesday.